Thank you for your interest in the Libertyville Stars Swim Club. Our team is made up of a very special group of athletes and dedicated volunteers. We are associated with USA Swimming and Special Olympics, and we practice most Sundays at Libertyville High School at 11:30 a.m. to 12:45 p.m. The Libertyville Stars Swim Club was formed in 2000 as The Cats Special Olympics Swim Team. The team name was changed in 2007. Team Members: There are approximately 30 team members, ages 14 to 55, each with cognitive disabilities (including Down’s Syndrome). The size of the team is limited because the safety of the swimmers is always of utmost concern. Volunteer Peer Coaches: One thing that makes our team different from most are our peer coaches. We have nearly a one-to-one volunteer peer coach-to-swimmer ratio at many of our practices. Many of our peer coaches have been with the team since it started. They have included top finishers in the state of Illinois, and most are members of the Libertyville, Vernon Hills and Mundelein High School swim teams, Cats Aquatics Team, Libertyville Masters and other local swim clubs. Our swimmers have learned so much from our volunteer peer coaches. They are great role models for our athletes. At the same time, our volunteers have learned a lot too; valuable life lessons about people with disabilities. As a result of being a part of our team, they look at all people with disabilities in a whole new light, with newfound respect for their abilities. Friendships between our athletes and volunteers have developed and extend beyond the pool. We get together for bowling and pizza parties too. Key Objectives: The Stars' key objective is to provide swim training and competition for individuals, 8 years and older, with mental retardation in an integrated community setting. This unique program gives athletes opportunities to develop physical fitness and life safety skills, demonstrate courage, experience joy, and participate in a sharing of gifts, skills and friendship with other Special Olympics athletes, their families, and the non-disabled community. Founders/Head Coaches: Becky Peacock is a mother of one of our swimmers, Blake (who has Down Syndrome). Serving as an advocate for people with disabilities, Becky strongly believes that when disabled and non-disabled people interact with each other, it brings out the best in everyone and they learn so much from each other. Becky coaches many Special Olympics sports (including swimming, tennis, alpine skiing, and snowshoeing). She coached her son when he represented Team USA in the World Winter Games in 2001 (Snowshoe); and was a head swim coach for Team USA at the 2003 Special Olympics World Games in Ireland. Her family was named the “2004 Family of the Year” by Special Olympics Illinois. Ann Davidsen is a former competitive swimmer at the University of New Mexico, the University of Alabama, and various Masters clubs. She is a licensed occupational therapist and certified water therapist. Ann’s daughter, Dana, now a competitive swimmer in college, was one of the team’s first volunteer peer coaches. Because of Dana’s involvement with the CATS Aquatic Team, it gave the team instant access to an accomplished group of junior high and high school swimmers, who became the core of the volunteer peer coaches. Our Vision: Becky and Ann shared a vision for a very unique swim team for athletes with cognitive disabilities; one that would use the local club swimmers as peer coaches to help teach and encourage cognitively challenged athletes how to become competitive swimmers. They teamed up with the CATS Aquatics Team, a local swim club, where they recruited young swimmers who would be willing to volunteer their time and talents each week. They gained funding from local donations from Kiwanis and Rotary Clubs, as well as private donations from individual donors, to pay for insurance, life guards, pool supervisors and supplies. Both Ann and Becky brought necessary skills to the team: Ann had the knowledge of competitive swimming and good relationships with local swimmers who could be potential volunteers; Becky, also a life-long swimmer, had excellent administrative skills and was thoroughly familiar with Special Olympics. She knew many of the local Special Olympics athletes and their families, and had experience with other athletic programs for people with disabilities. Both Ann and Becky are certified lifeguards. Ann and Becky approached John Fischl, the Libertyville High School Aquatics Director, with their plan. John supported their idea and gave them access to the high school swim pool for the team’s practices. Becky and Ann share a passion for helping people with disabilities develop to their fullest potential; developing the swimming abilities of athletes with disabilities – and in so doing, helping the athletes gain greater confidence in themselves and stronger relationships with their non-disabled peers. Member of USA Swimming: The CATS Special Olympics Swim Team is one of the few Special Olympics swim teams in the country that is a member of USA Swimming. This enables the team to compete in regular USA Swimming meets as well as Special Olympics and special recreation swim meets. Raising the Bar: he Stars Swim Team is making an impact on Special Olympics. Although our goal has never focused solely on "winning," it has always been to teach our swimmers how to become competitive swimmers. Learning proper technique, and always striving for improvement, is important. Sportsmanship is critical. And having fun is a must. 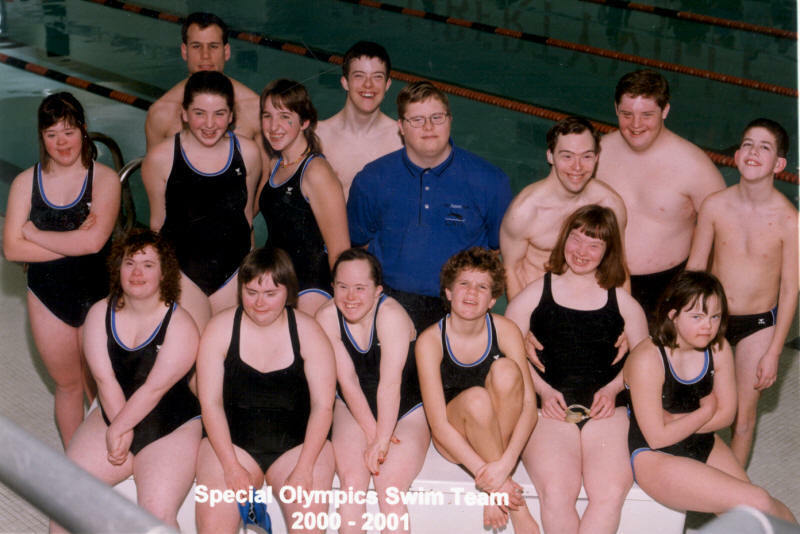 In November 2004, for the first time ever, Special Olympics Illinois offered the 400 freestyle; and 100 breast, back and butterfly in one of their swim meets (and the Stars athletes were the only Special Olympics team with athletes entered in each of those events). Over the years, more and more Special Olympics swimmers across the state have entered and won these events. Special Olympics is a tremendous organization that offers people with disabilities an opportunity to compete and win. But above all, it's about supporting one another, being "brave in the attempt" to win, and learning new things. It's achieving the challenge to do better than anyone expected you can do. One thing we’ve learned from our athletes is that we should never put limits on their abilities. It’s amazing what they can accomplish when they are given the opportunity to learn and develop. Over the years, the coaches have seen firsthand how being part of the swim team can change lives. When they started the team, some of the swimmers could barely swim one length of a pool. (Today, that is one of the prerequisites to joining in the team). "It’s so gratifying to see our athletes' dramatic improvement and accomplishments… both, as swimmers, working to improve their times at every meet, and as individuals who have grown so much in their confidence and abilities," said Becky. "Being around our peer coaches, they learn so much. They are becoming great athletes and they are also much more comfortable in social settings as well."